Stanley Baker ... Lt. John Chard R. E.
Q: How come Colour Sgt Bourne doesn't get the VC? A tribute to both sides of an uneven war. ZULU steers away from making one side good and one side bad. Okay, we identify with the British troops in the face of insurmountable odds and all that - but you have to admire the ZULU warriors all the more for going up against them unfalteringly and the 'pan' across their fallen bodies isn't so much a moment of joy for the Brits saying "Ha, look how many we've killed of you lot" as opposed to clearly showing what an awful waste of life it all actually was. The film clearly marks out why the British Army was as good as it was. Organisation. Okay, we got butchered a couple of times, but when placed in a position with time to ready ourselves the British forces where pretty unbeatable. One of the huge advantages being the fact that often we were going up against quite primitive 'warriors' with even more primitive weapons. The whole staying smart, obeying orders and keeping in line, firing in order helped to saved all those mens lives and is a neatly condensed show of arms to everybody out there. Each setpiece of British organisation re-inforces just how good they were, just how well they were drilled and just how murderous they could be with their efforts. The film clearly marks out why the ZULU forces wasn't quite so good. It wasn't a lack of courage or absence of valour, it was simply down to the fact that they were outclassed weapon and organisation wise. Okay, they made pretty well organised charges and all that, but against rifles that's just cannon fodder. But as is pointed out by the Dutch guy, they're merely counting your guns. The ZULU's in the film aren't daft guys in furry underpants, they're the bravest warriors ever seen (or ever likely to be seen). Well organised forces wilted in the face of British troops during that period, they didn't. The fact they salute the British and walk away merely adds to their nobility and patheticises the British efforts - eventually they would have crumbled, the British would have lost against such odds if the Zulus had pressed all at once. They didn't. They walked away saluting the British effort. That moment alone, with Caine blazing about how they're being taunted and the Dutch guy chuckling to himself struggling to believe what is actually taking place is the icing on the cake of the gradually increasing tension. For a moment of absolute spine tingling tension you can't beat the ZULU singing being countered by the Welsh Choir of voices. It's an equaliser as such, a moment of contrast and compare between the rigid red suited Brits and the tribal shield clapping chanting. 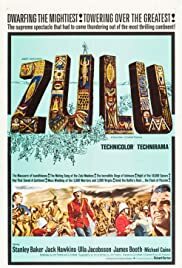 John Barry's music is a constant presence and always perfectly suited to the moment, I'd be interested to know the content of the ZULU chants though, whether they are authentic (which I figure they are) or simply picked out by the director for looking the most intimidating. Top film, no insult to anybody.